quickie quote: … Duty of Delight…. Virginia the Blogger has a relatively Good Reason for being M.I.A. the last 2 days of her Lenten Challenge: KIDNEY STONES. After partying a Wee Bit Too Much as Rolling Stones (blaring pain, not guitars) the misbehaving stones finally rolled their way out yesterday evening after their 24+ hour romp. Instead of writing a lovely post as plotted about my parents’ 57th wedding anniversary (’twas yesterday), here’s another pic+ quote.. 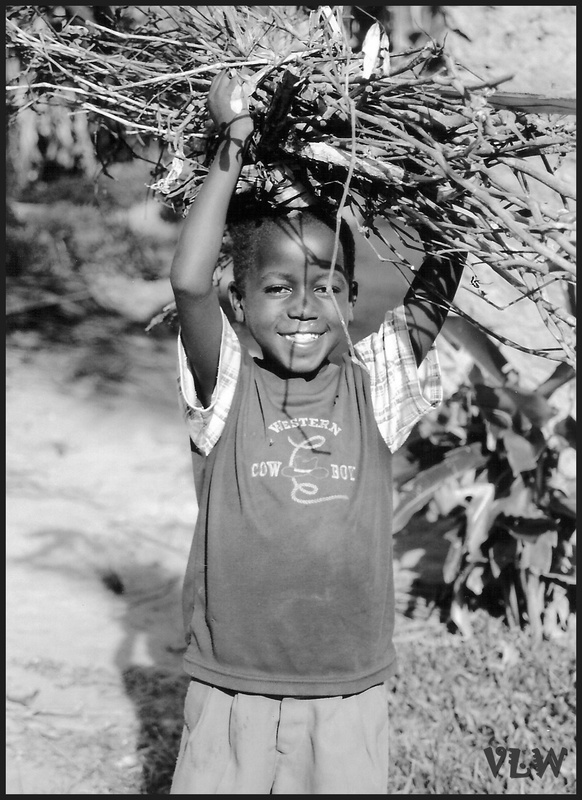 The young son pictured is helping his mother gather sticks for their cooking fire in Kagera, Tanzania. He’s so full of joy & happy to serve. Gotta ask, am i this happy to serve others? to do it with a smile (that lasts awhile?) Do i sow seeds of joy or seeds of rushed brusqueness as i go about my daily duties? Can i view the mundane with DELIGHT? Have i ever considered Delight a Duty?? Dorothy Day (one of my heroes) thankfully spells it out for us: we are to CULTIVATE a spirit of joy. Cultivating something requires effort & energy & careful tending. As we cultivate joy (carefully, tenderly) we must also root out weeds of frustration & anger & fear that choke our growth as doers of delight for the Heavenly Kingdom. This entry was posted in Lent, Quotes and tagged Africa photos, Dorothy Day, duty of delight, faith, Faith in Action, inspirational quotes, joy, Lent. Bookmark the permalink. 4 Responses to quickie quote: … Duty of Delight…. Glad the stones are gone and that you’re back. Keep drinking that water!